Okay, folks – today is the day you’ve all been waiting for! 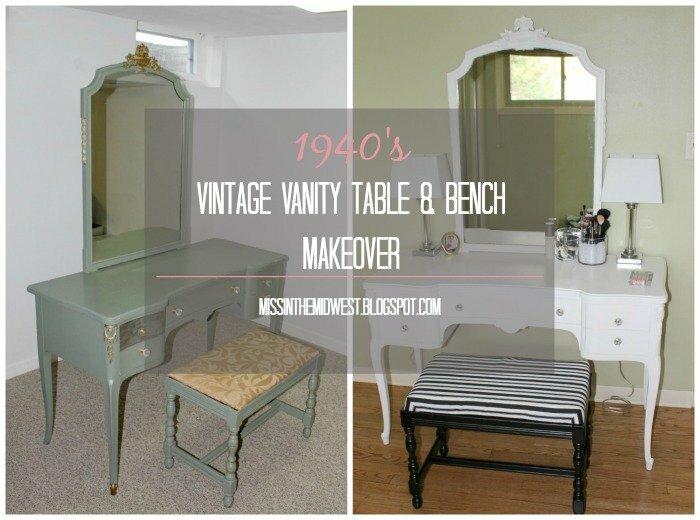 I am proud to bring you a post-project recap of my 1940’s vintage vanity table and bench makeover! Note: This is going to be the longest post in blog history. Read on if you dare. Let me start with a little back story on how this project came to be. Since I was a little girl, I always have wanted a makeup vanity. I’m not exactly sure how the obsession started, but I think it is safe to assume that all my favorite movies had their leading ladies sitting at a vanity at some point, and I was hooked. It just looked so glamorous! My room at my parent’s house was never big enough for me to have a vanity, and until now, it never made sense for me to invest in one since Ryan and I knew we would be moving around quite a bit. Ryan built me a fake vanity in our home in Des Moines, which consisted of a long shelf, a hanging mirror, and plastic drawers for storage. Hey, it worked pretty well. Then when we moved to Madison, we had a double vanity in our master bathroom, so it just made sense to make that work. Once we found the home that we are now renting, both Ryan and I agreed it was time to either build or invest in a vanity to put in one of the extra bedrooms since we only have one, very small bathroom. 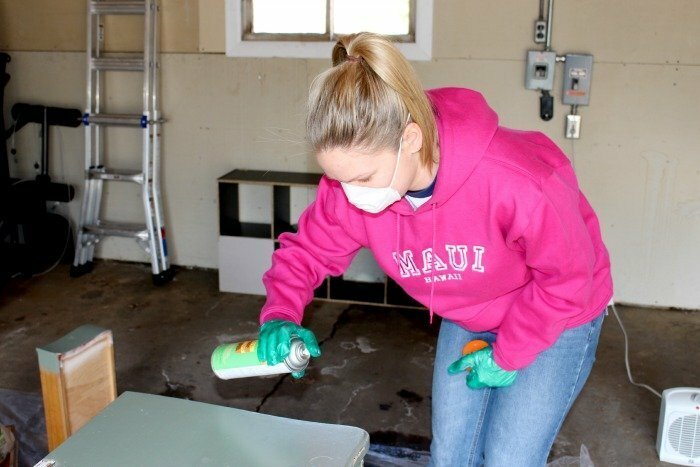 I started searching for vanity tables the first week we were in this house. I was lucky enough to find “the one” right away, and the owner only lived 30 minutes from us. I just had a witch vibe (Rachel Zoe reference, anybody?) about it, so I told Ryan we needed to jump on it. I think he thought I was being dramatic, but like the great husband that he is, we contacted the owner and off we went. Sure, the paint job was heinous and the bench is not original to the table, but the bones were there and that’s what ultimately mattered. The owner wanted $200 for it, and she was being a bit stubborn about negotiating the price. Ultimately, her son stepped in and said he would give it to me for $180. Sold! Now, let the adventure begin … Here are some before shots of vintage beauty. Don’t judge me – that’s what I named her. I mean honestly … what was she thinking when she decided on this paint color scheme?! Beauty is in the eye of the beholder, I suppose. 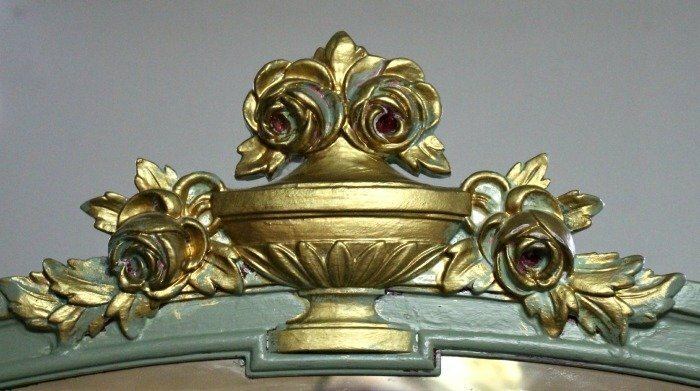 Something that I discovered after we brought the table home and what has become my favorite part of this vanity is where it came from. 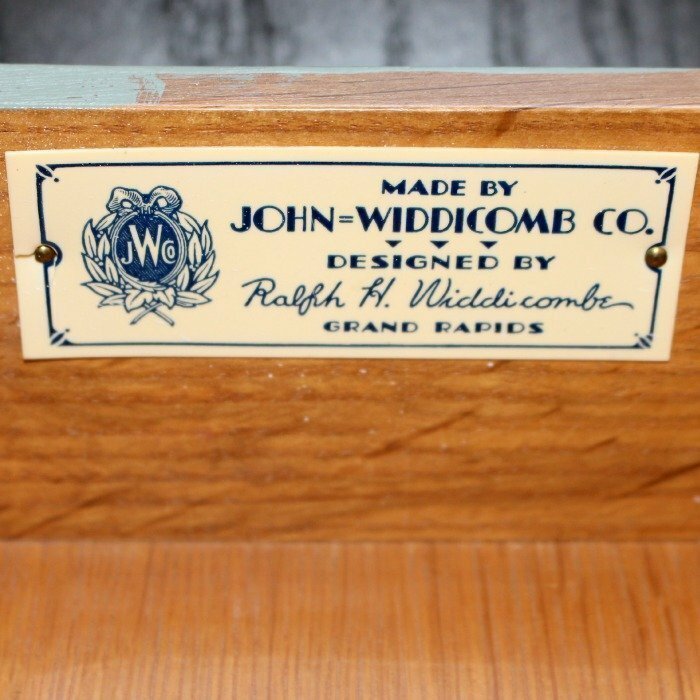 My Grandma Bette actually grew up in Grand Rapids, Mich., and she knew what John Widdicomb Furniture Co. was when I asked her about it. So, now I feel like I kind of have a family heirloom! My mom found some historical information about John Widdicomb, which is how we determined this table was from the 1940’s. 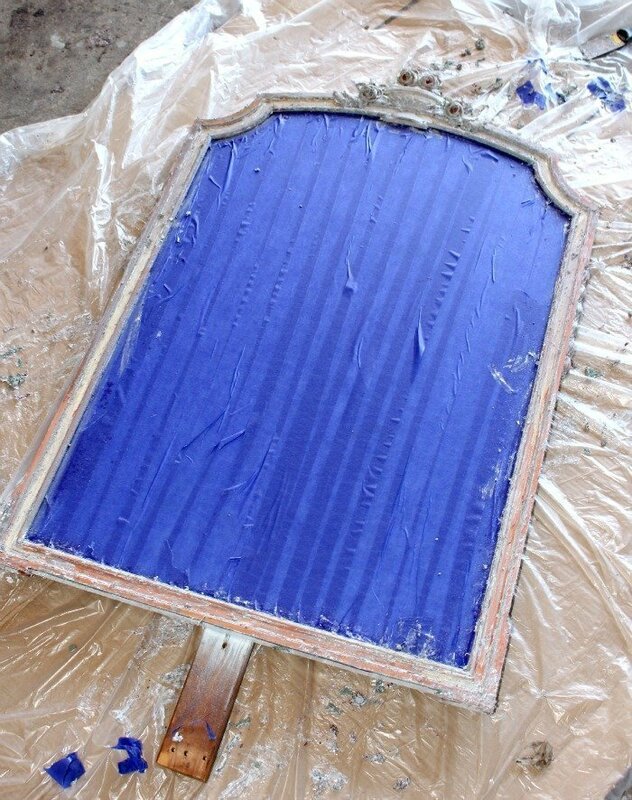 Now, onto the fun stuff – paint stripping, sanding and general TLC of vintage beauty. 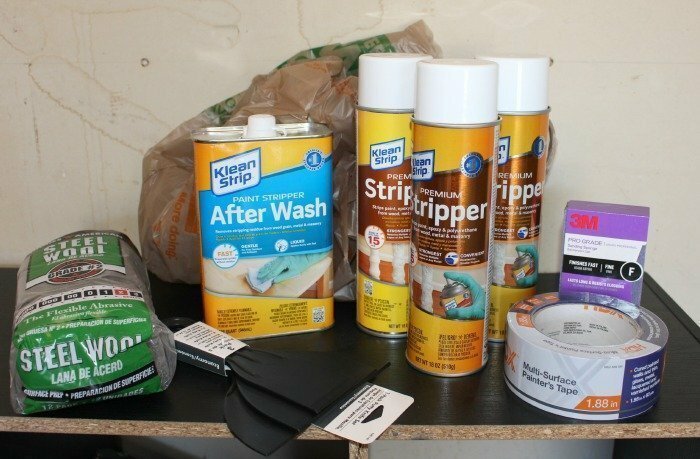 These are the supplies that we started with. Ha. Haha. Hahaha. I laugh now from how naive we were that only these few things would do the trick to get the table down to its original glory. 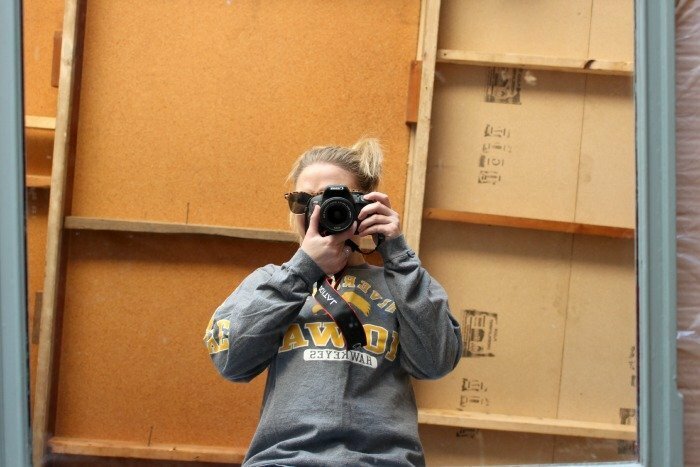 I have my mask on upside down in this picture … no big deal. 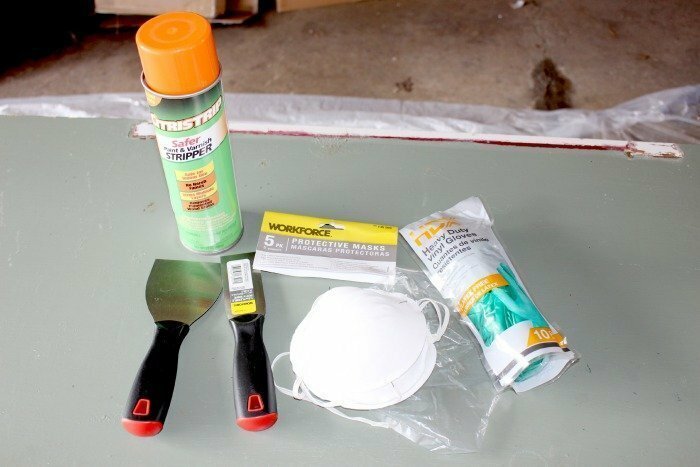 This was the table after the first coat of paint stripper. The green stuff came off piece of cake, but that red paint? Yeah, that gave us a few headaches over the course of this project. Time for more supplies! I’m pretty sure the employees at Home Depot knew us by name by the time we were done with this. 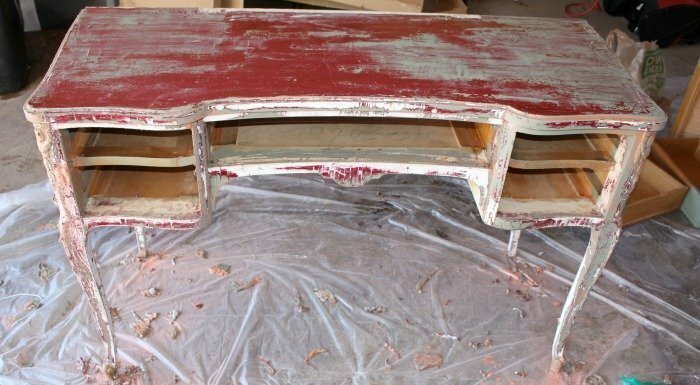 Another layer down – see the red paint finally starting to come up on top? There were a few choice words being thrown around at how difficult that stuff was. 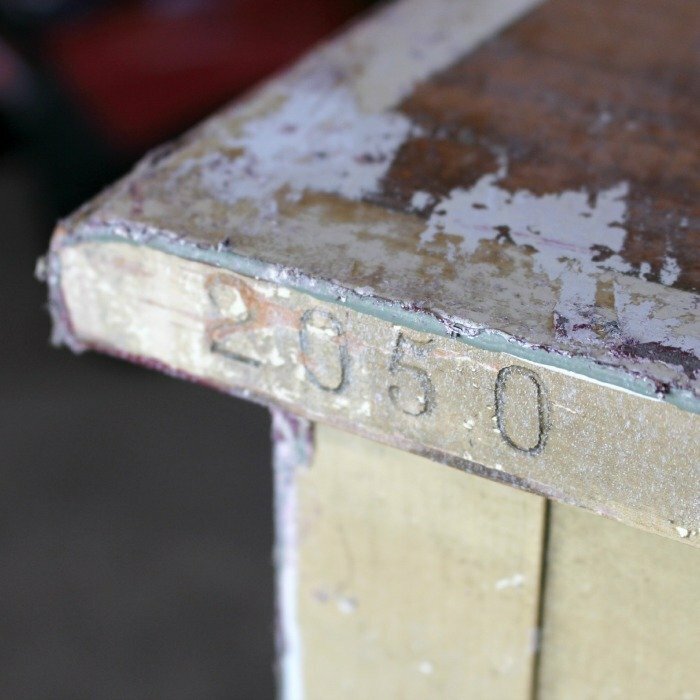 We also discovered the production number on the back of the table. 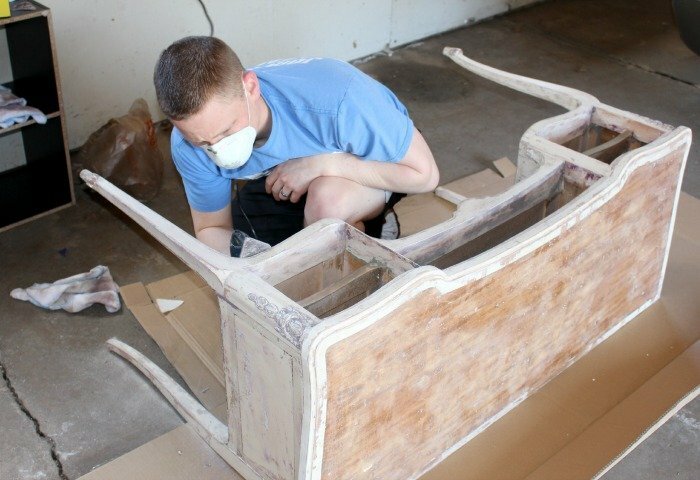 Since we only had one electric detail sander, I let Ryan take the reins on the table while I started to work on the mirror. 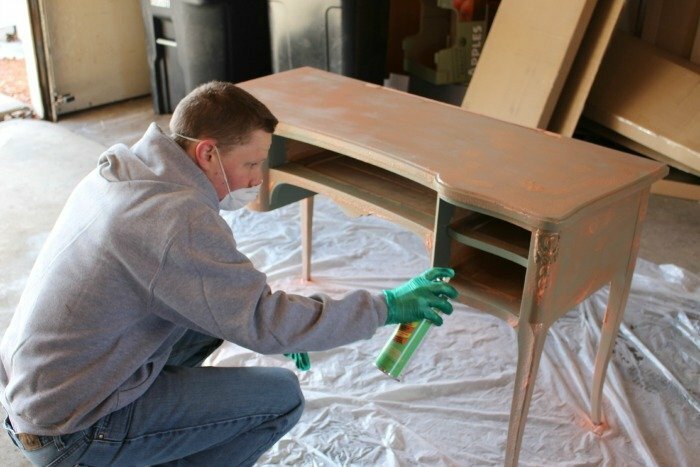 Meanwhile, Ryan is over yonder sanding the crap out of the table. It was neat to see the table in its original form; it was cream with a wood inlay, and the trim detail was unbelievable. It’s a shame that somebody painted over it. Next, it was time to tackle the stool. 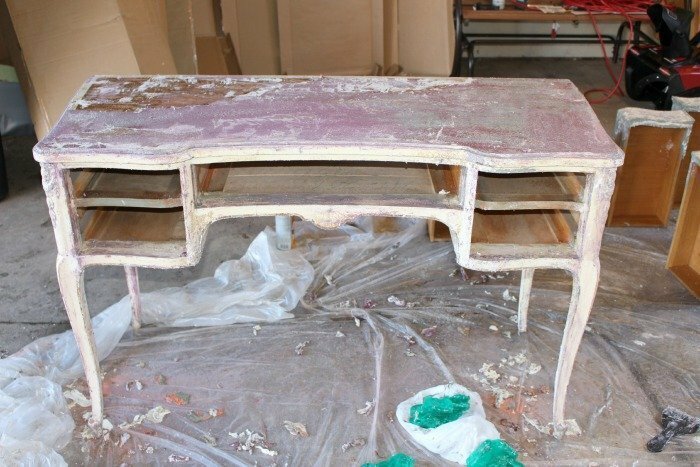 Since it wasn’t original to the table and was in pretty good shape, I decided to skip stripping the paint from it and use spray paint instead. 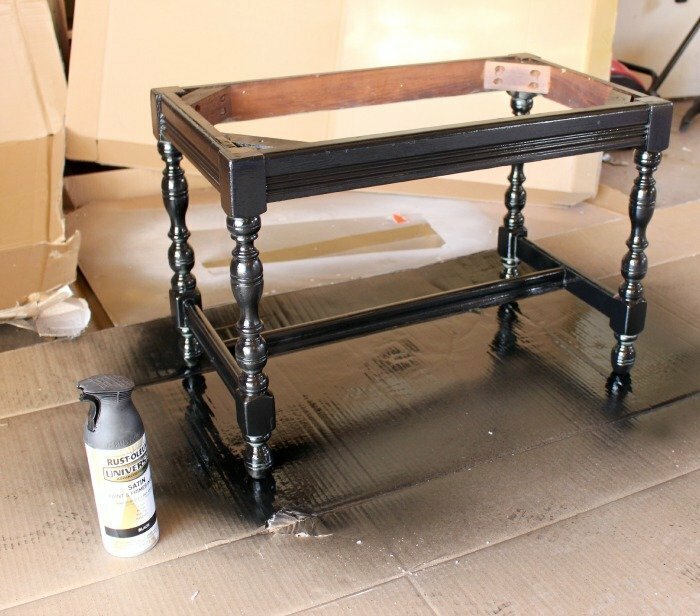 I went with a satin black from Rustoleum to make it pop from the table (that eventually would be white). 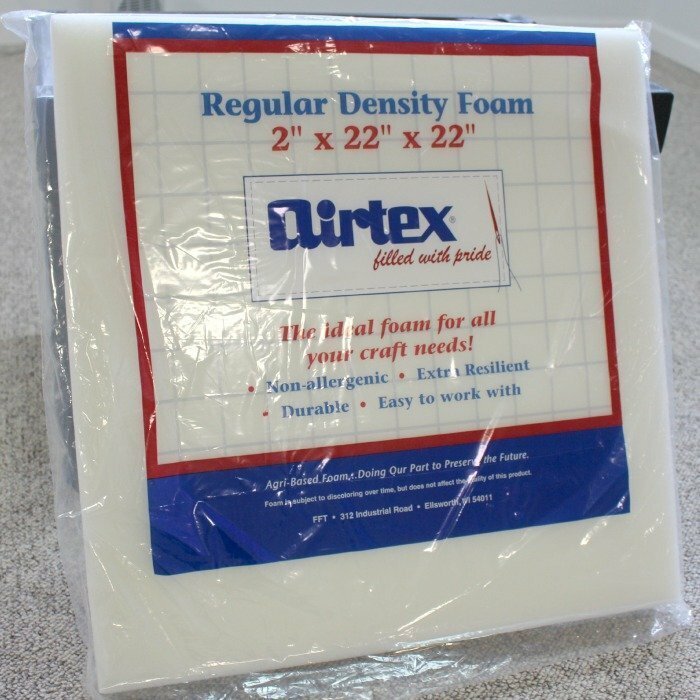 The foam and fabric came from Jo-Ann Fabric. 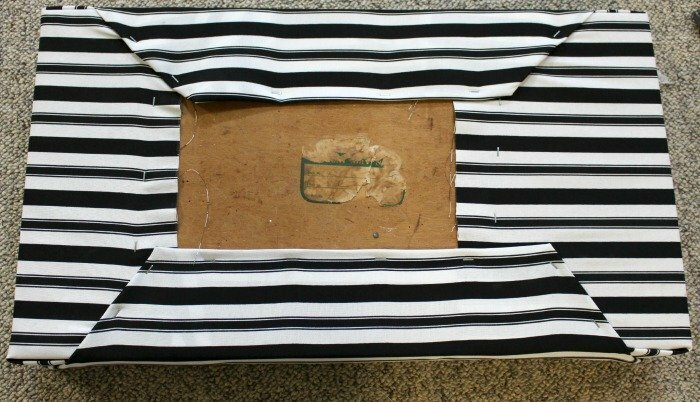 Neither Ryan or I had ever reupholstered anything before, so we kind of made it up as we went. 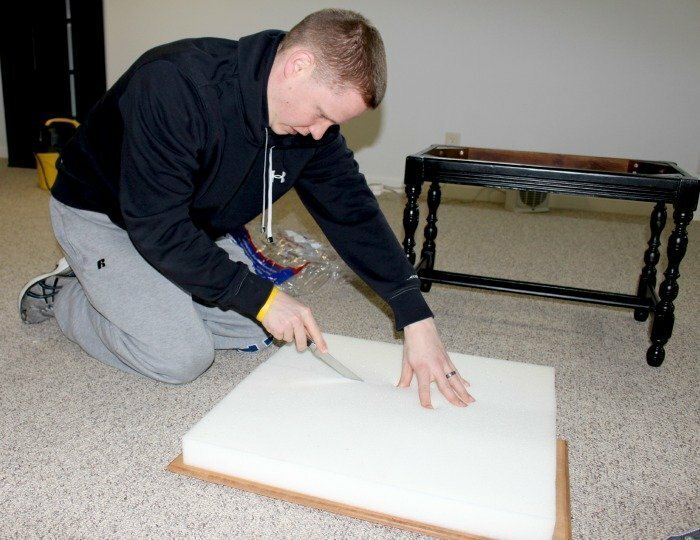 Ultimately, I just folded the fabric over the wood and foam like I would a present and made sure to pull tight. 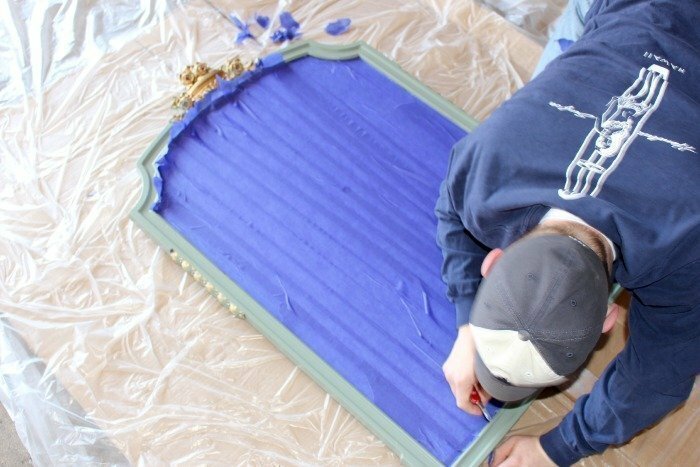 Then, it was FINALLY time to start painting the table and mirror! I did most of the painting myself while Ryan was at work, so I unfortunately don’t have any pictures of this process. That’s probably a blessing in disguise since this post already is longer than a novel. The chosen paint color was Behr’s Decorator White from Home Depot. 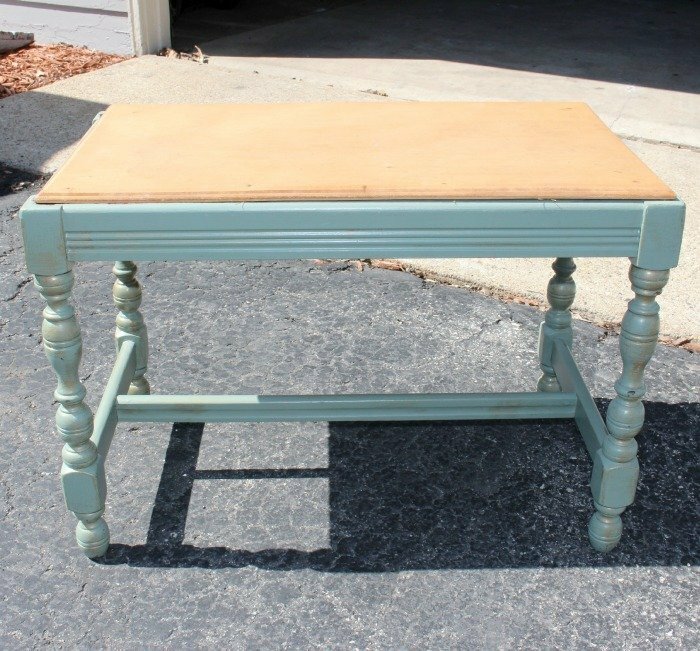 It is a creamier, softer white – I wanted to try to preserve as much of the vintage charm of the table as I could. I also picked up simple clear crystal knobs for the drawers. Ta-dah! Ladies and gentlemen, I present to you vintage beauty! This project was definitely a labor of love, and I couldn’t be more thrilled with the result. 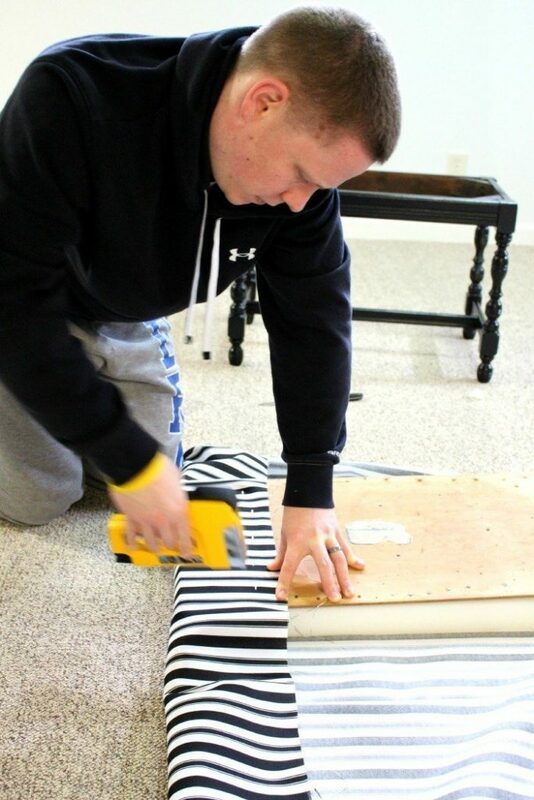 I also couldn’t have done it without Ryan’s help – he sure is a handy man! 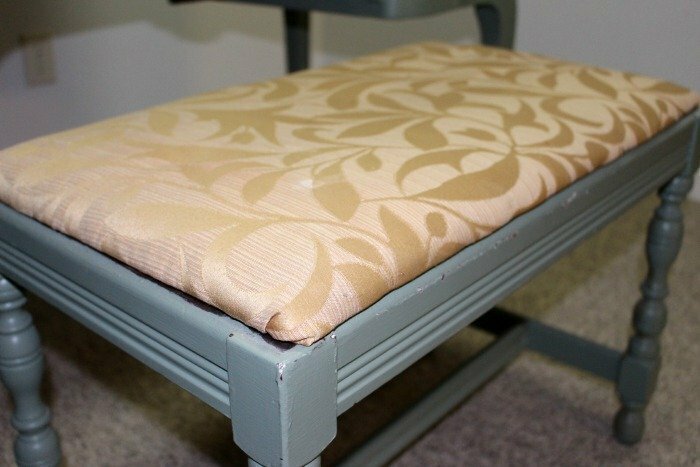 I think we are going to take a break from any major furniture makeovers for a while, but we definitely caught the DIY bug and are now always keeping our eyes open for fun pieces to fix up. If you made it to the end of this post, you’re a trooper! Here is one more before and after shot of vintage beauty. Wow! How beautiful! 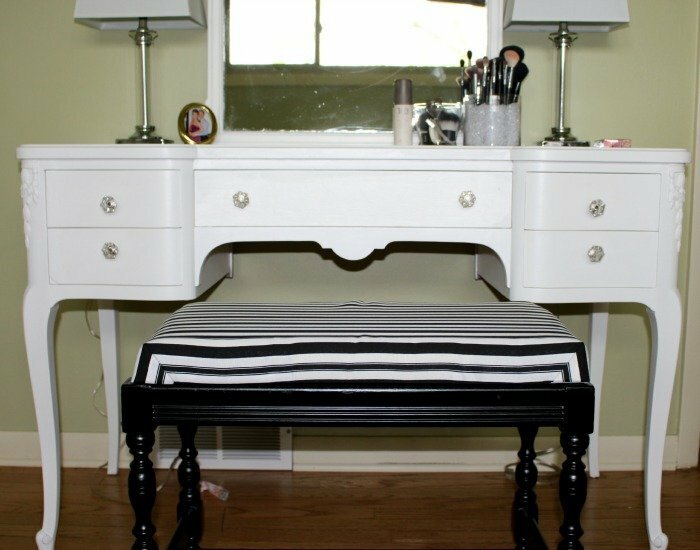 I used to have a vanity when I lived at home and I grew up in a victorian home with everything vintage so I definitely miss that! you guys did a great job! Karly, it's beautiful! 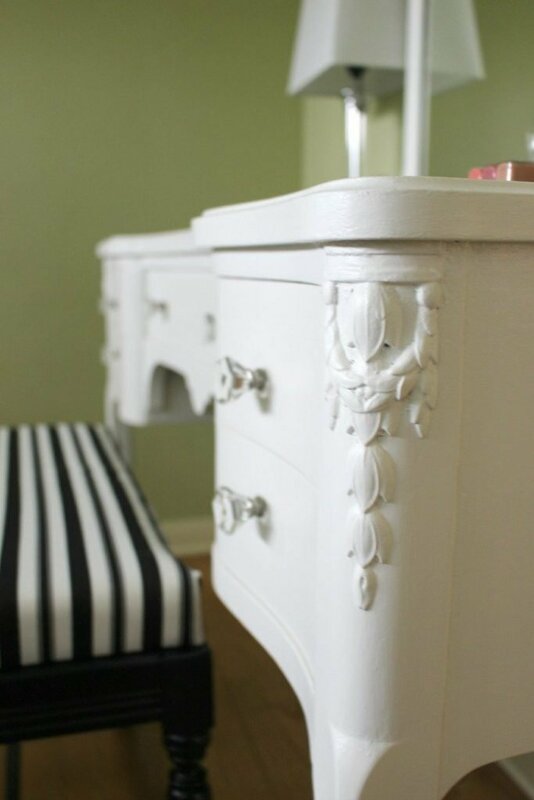 You did a great job, and what an awesome Craigs List find, I love the detail on the vanity. I hear you with always wanting a vanity, there is just something about it! 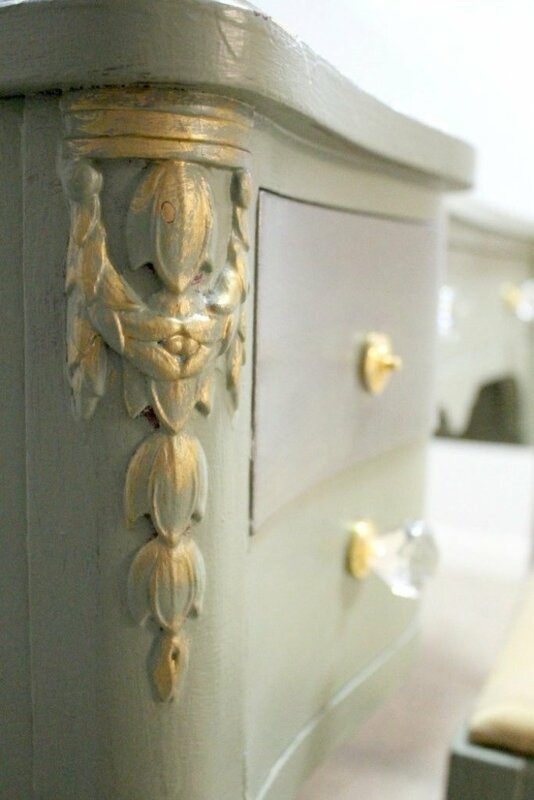 Refinishing pieces can be a beast, but its so worth it when you get to love on the finished project! I'm learning more about you, its funny I am from Madison originally but live in the Schaumburg area now – all good places! WOW!!!!!! That is incredible! It looks beautiful. What a transformation! You guys are so talented to be able todo that! I absolutely love it! LOVE love love it!! You guys did an amazing job! 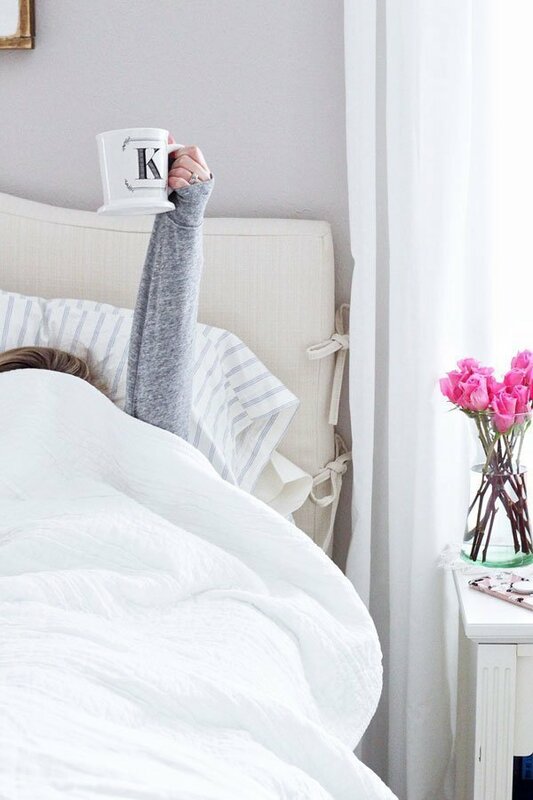 The clean white color you picked is perfect. 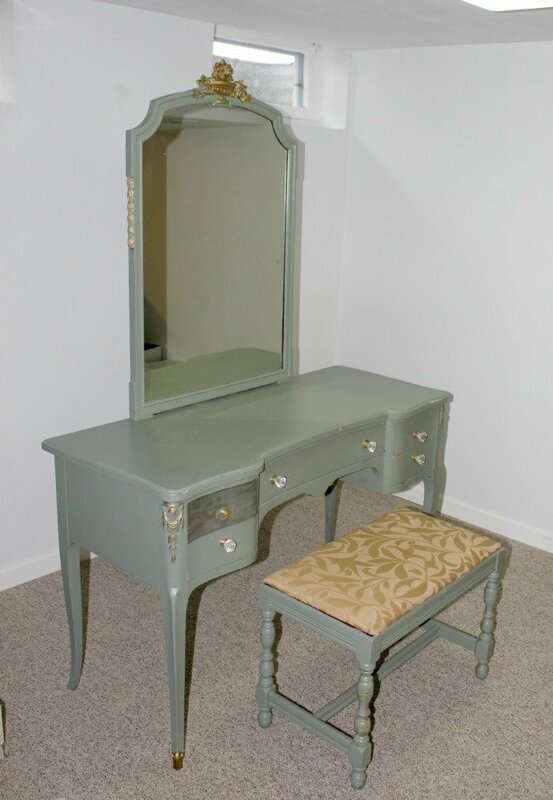 I've always wanted a vanity, too and I am for SURE getting one when we move in a few months 🙂 Good idea to check out Craigslist. And how cool that it came from Grand Rapids – I'm from Holland, MI!! Thank you!! I sometimes can't believe we did all this either, ha! Thank you! It was quite the project, but I'm thrilled with the results. I was happy to be able to restore it to its former vintage glory. Thank you! 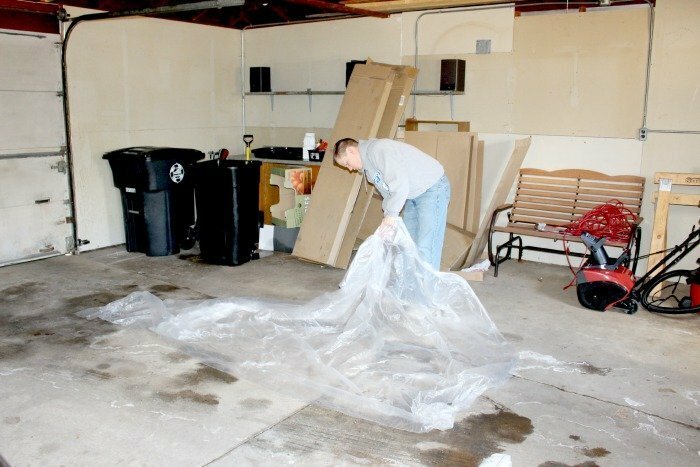 Be sure to look through Craigslist … you never know what treasures you may find. Oh girl, trust me – I am far from crafty. But I'm glad I was able to fake it with this! YAY I've been waiting for this! Girl, it's perfection. I've always wanted a vanity too, one day 🙂 You guys did a fantastic job! oh my, this is so fabulous! 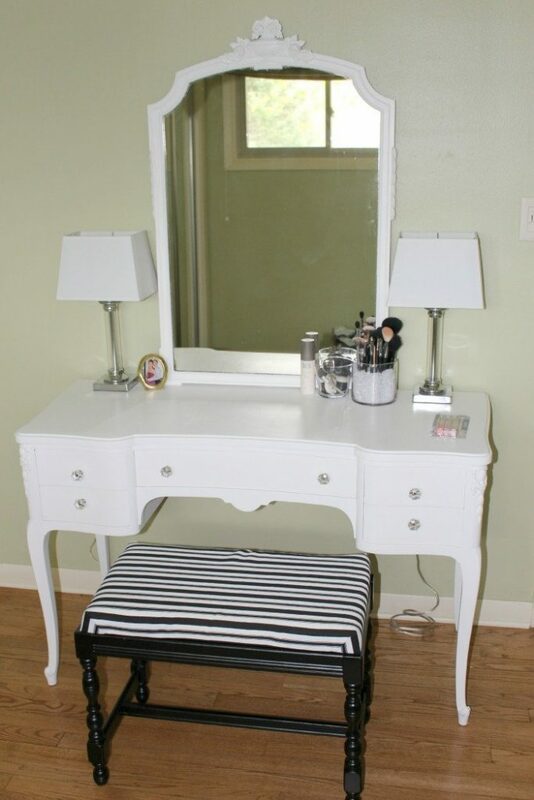 i want a vanity and this one is so gorgeous. amazing job! This turned out amazing! 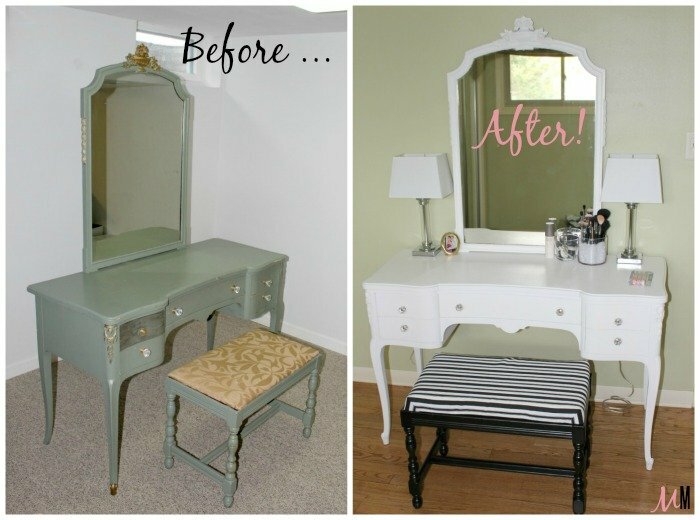 I'm so jealous, I totally want a vanity! I don't have room for it right now but eventually I'm going to hunt one down 🙂 I love what you did with the bench too! It turned out fabulous! So glad you finally have the vanity you always wanted! It turned out AMAZING! 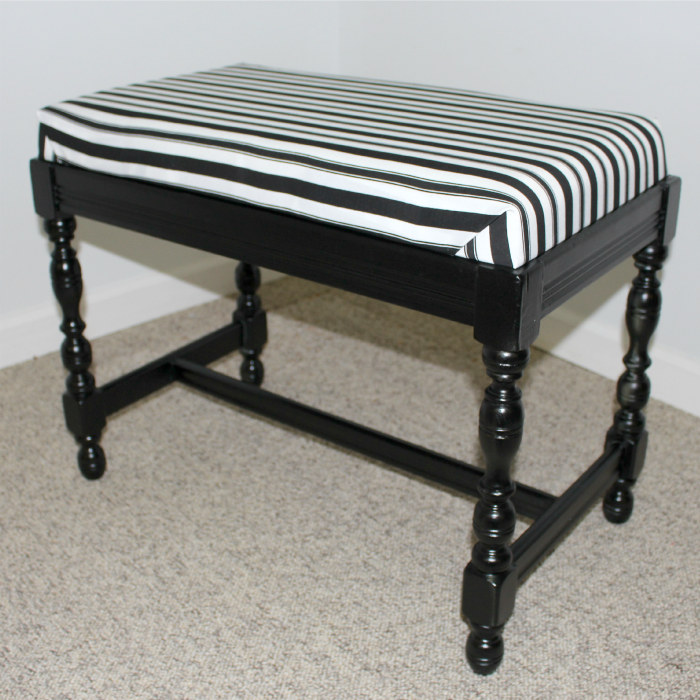 I'm so impressed with the transformation and I love the black & white bench! You guys definitely have some skills! I have been waiting for this reveal for quite some time!! You guys did a wonderful job and now I'm sure getting ready is even more fun! WOW that's an awesome revamp, and it looks great! Glad to see a piece of vintage getting a new leash of life. 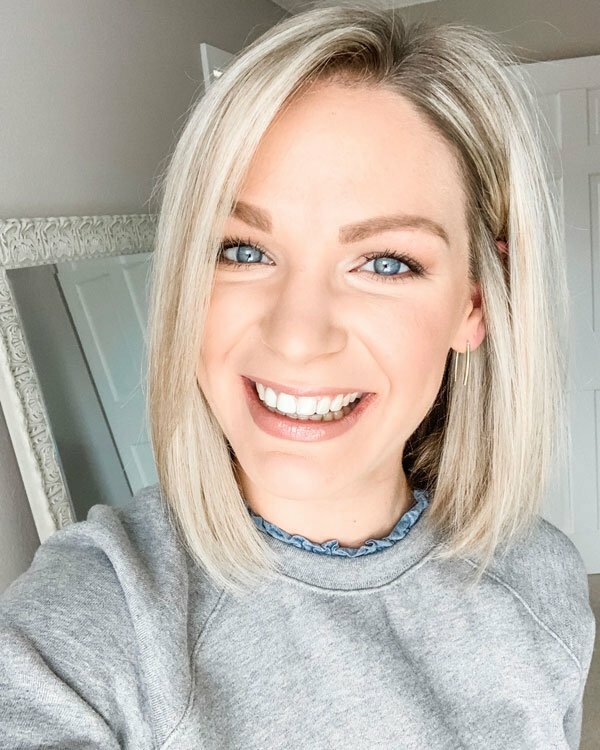 WOW cannot believe you did all of this – it looks great!!! !